It's Sept. 5, which means it's 1 month until the calendar says Oct. 5...the same day I hopefully accomplish that insane task that just 2 years ago I said I'd never do--run a marathon. In one month it will be just after 7:30AM CST and I will be on my way to the start line of the Milwaukee Lakefront Marathon...to run hard for somewhere in the neighborhood of 4.5 hours. This knowledge should freak me the heck out...but it really doesn't. I'm sure that will change as we pack up the car to drive to Milwaukee the day before the race (more likely the minute I start my taper, heh), but for now I'm feeling more relief and anticipation. Relief because I know that my training taper is less than 2 weeks away (and my knee is behaving pretty well) and anticipation because all signs point to my making it across the finish line in one piece (thanks again to the healing right knee...and my first 20 miler that went much better than expected). Yesterday I received the next larger size of the half-length Nike tights I had ordered in the event of a cooler weather race. They fit better than the original pair I had ordered...but had a small area of defective unstitched seam, so back they go. I really hope they will exchange them fast--I'd like to get in at least one longish run before race day, just to make sure that there are no fit/function issues. I ordered them directly from Nike...and they are none too fast with their shipping, unfortunately. 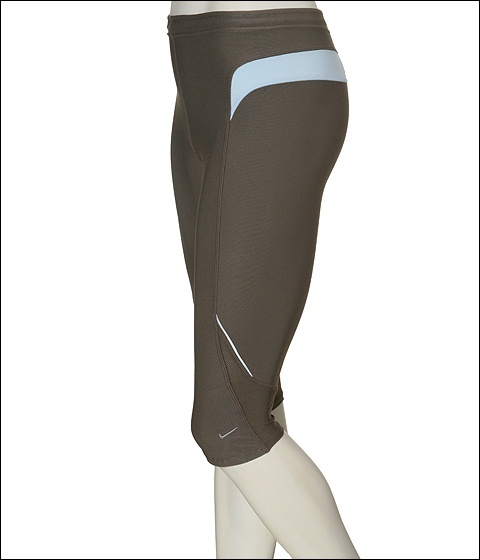 The tights are really nice...they have a small zip pocket along the lumbar area. I won't buy any running bottoms that don't have some sort of secure pocket generous enough to hold my inhaler and cell phone. The length is perfect, too. Great for runs when it's a bit too warm for 3/4 tights, but too cool for a skirt. Yesterday I had a really nice 5 mile run in the rain with my local friend, Joni. 2 days prior we had the warmest day of '08, but yesterday was a good 30º cooler. It had been so long since I'd run on a cool, rainy day (and with a jacket on). It was pretty invigorating and we had a fantastic time bombing through some pretty deep puddles. By the time I got home I was pruney and had squishy shoes. It was fabulous! Oh, and I forgot to say that you will be going into your race well better trained and prepared for it than I was for mine given I had to baby myself starting at week 11 in my training. That shook my confidence a bit so, you will be solid gold given how well you have been with your training consistency. Awww...thanks, man. That is really reassuring, especially from you. You are the king of HTFUing...seriously. You ran a marathon under some of the worst possible weather conditions and with a stress fracture! I know JK said that marathon was horrendous and DH's aunt was there and also said it was the worst weather she'd ever run in--and she has run dozens of marathons. Glad you were able to get back to Ludington for a little fishing. How was it in the rain? Sounds like they were biting. I am so jealous of your salmon dinners!